Mon Oncle, Jacques Tati’s followup to Mr. Hulot’s Vacation – which introduced the endearing character of Monsieur Hulot to the world of cinema – was, like the latter, an audio-visual spectacle of the first order. However, unlike the latter, which was lighter and more freewheeling in tone and feel, this one seemed to me Tati’s version of Chaplin’s Modern Times. Shot in glorious colours, this high farce is a delightful mixture of immensely funny gags and searing social satire. Set in an unknown point of time in Paris, the film placed the bumbling and lovable eponymous character at the unique juncture between the carefree and joyous lives of the common Parisians, and the ultra-modern, gadget-filled mansion of his brother-in-law. And, while the dichotomy and contrast between these two worlds provide loads of laughter, they also show how incessant automation might make life easy while dehumanizing it at the same time. Meanwhile his brother-in-law employs him at his factory, and as expected, his presence is enough to hit the factory’s best-laid disciplined environment for a toss, albeit inadvertently. 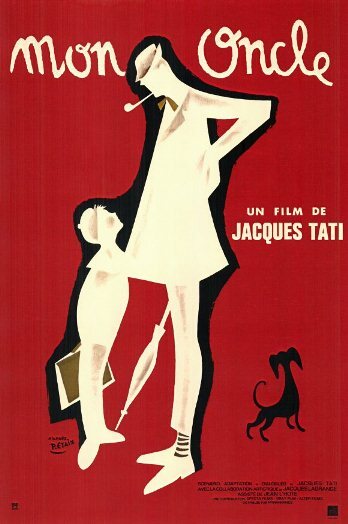 Tati wasn’t just spot-on as the pipe-smoking and ever-so-courteous Hulot, the support cast too was incredible in portraying the series of idiosyncratic characters that populate the film. Though uniformly filled with hilarious gags, the mischievous acts of the children and the party sequence provided the maximum number of laughters for me. Tati is brilliant and I love how there is social commentary just below the surface. He's a fascinating director. Yes, absolutely. The satire & commentary made the comedy both biting & brilliant.